North America’s best ski town, leaf peeping mecca, best small arts town, hippest hotel, best cat ski destination, best farmers market, top lake, and the list of accolades goes on. Where is this place? Have you been there yet? Residents (and loyal visitors) of the Nelson and Kootenay Lake region in southeastern BC have long known of the diversity and appeal of its small towns with big city personalities. Nestled on the hills surrounding Kootenay Lake - one of Canada’s top 10 lakes - is historic Nelson, Balfour, Ainsworth Hot Springs, Kaslo and Meadow Creek. Often remembered as the setting for the 1987 Steve Martin comedy Roxanne, the area has been modest about it’s accolades. Following the win of Powder magazine's "Ski Town Throwdown" 2012 competition, one of Canada’s best kept secrets is out. From east to west coast, 32 ski towns across the continent faced-off in head to head battles vying for the title of North America’s best. Even though Nelson’s competition may have offered a wonderful ski experience, Whitewater Ski Resort and it’s amazing climate, epic powder and the culture of the area is what set it apart. 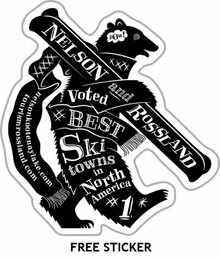 In addition to it’s recent title, “Nelson/Rossland voted Best Ski Towns in North America”, the Nelson-area recently gained international recognition in Outside magazine for being home to Baldface Lodge, the Best Cat Skiing Destination in North America. Baldface also recently appeared for a second time in GQ magazine which has named the lodge one of the top 10 hippest hotels. While the area may be home to one of the trendiest cat ski operations in the world, it is also home to the original cat ski provider, Selkirk Wilderness Skiing, north of Kaslo in Meadow Creek. We are also recognized as the Cat Ski Capital of the World with more operators and more snow than anywhere else! But the Nelson and Kootenay Lake region isn’t simply a destination for adrenaline junkies. It goes beyond adventure and offers one of the best arts and culture scenes in North America. Nelson was included in author John Villani’s The 100 Best Small Art Towns in America, and if you need more proof of the area’s love for arts and culture simply visit one of the many live music venues. For instance The Royal and Capitol Theatre bring in some of North America’s best local and touring theatre productions from John Mayall to Ballet Jorgen. Before you head out for the night head down to Touchstones Nelson: Museum of Art and History where they curate a state-of-the-art historical journey of the area, and regularly display works and installations by local and international artists. Local art can also be enjoyed as you wander up and down the historic downtown streets of Nelson and Kaslo, as many local restaurants and boutique shops proudly display the area’s talent. You can also experience history and heritage through a variety of tours including historic homes, fire station, hotels, walking tours and the Nelson Brewing Company.. If world class art and music, award winning powder, fresh air and water, big city dining, boutique shopping and spas are what you’re looking for, then what are you waiting for?